35 And he said to them, “When I sent you out with no moneybag or knapsack or sandals, did you lack anything?” They said, “Nothing.” 36 He said to them, “But now let the one who has a moneybag take it, and likewise a knapsack. And let the one who has no sword sell his cloak and buy one. 37 For I tell you that this Scripture must be fulfilled in me: ‘And he was numbered with the transgressors.’ For what is written about me has its fulfillment.” 38 And they said, “Look, Lord, here are two swords.” And he said to them, “It is enough” [ESV]. First, we might note the hyperbole of selling an essential garment in order to buy a sword. What is being emphasized is the critical situation that is developing. 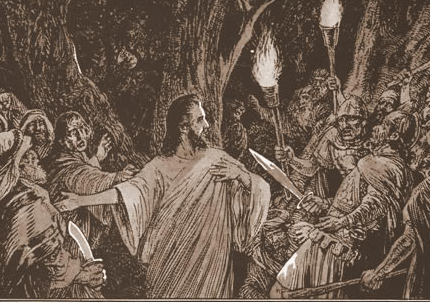 The context of this setting is immediately before they go to the Mount of Olives where Jesus will be arrested and where Peter will use one of those swords (John 18). “Then Jesus said to him, “Put your sword back into its place. For all who take the sword will perish by the sword” (Matt. 26). But back to the immediate context of the “swords”–there are clear clues in this hard saying for us to follow. We are told that the disciples possess “two.” Jesus reply, “It is enough,” can only mean either 1) that two swords are sufficient to fill the prescription [that the Scripture about being “numbered with the transgressors” must be fulfilled](Marshall thinks this not “probable”) or 2) that “enough” is a rebuke to the disciples for not understanding him.